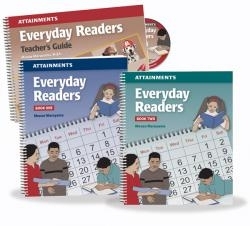 Everyday Readers Curriculum features a collection of 36 stories, one for each week of the school year. They incorporate educational concepts—like counting, health, and language skills—and are intended to be read aloud to young students, ages 4–9. The Curriculum includes two Everyday Readers storybooks and a Teacher’s Guide. The photo-illustrated stories range from 6–10 pages each, with about 25 words per page. Photos highlight story characters and other elements in the narrative, encouraging students to follow along and understand the storyline. Stories end with a three-question comprehension activity. Stories follow a chronological sequence so you can present seasonal themes and events. The Introductory Kit includes Everyday Readers Books One and Two, Teacher’s Guide with a PDF on Win/Mac CD, and a Classroom License for printouts. The Classroom Kit includes five sets of Everyday Readers Books, plus all other items in the Introductory Kit. 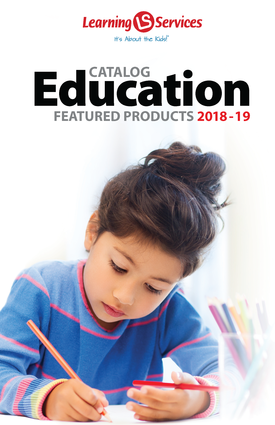 The Teacher’s Guide provides lesson plans for each story—complete with teacher scripts, student learning objectives, and story page illustrations. The Guide also includes additional vocabulary and sequencing activities, which can be printed out from the PDF CD. Each sequencing activity is differentiated by difficulty: in Level 1, students point to photos that belong in the story; in Level 2, students use the photos to retell the story in sequence; students select a photo, then tell an original story in Level 3.